We have covered Apple’s Cards app for the iPad, a quick and easy way to create print cards on the iPad for Apple to print and mail for you. Thought there is yet to be a iPad version of Cards from Apple, the 2X feature makes the features completely usable. For postcards, Sincerely Ink is the power behind many iPad apps that offer to print and mail your photos. The app offers a very nice list of card layouts that you can add photos (filters, sizing and rotation is supported) and edit text. When the card is as you like, Sincerely Ink will print a 5 x 7 card at 300 DPI then mail it for you ($1.99 in the US). 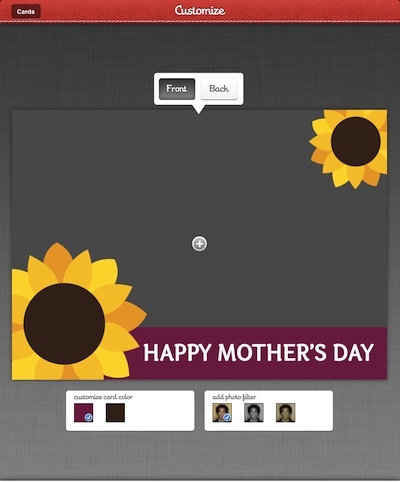 As a reminder, Mother’s Day is coming up, grab the free Sincerely Ink app and get a card in the mail! Sincerely Ink has a nice list of card design groups. The major holidays and social occasions are all covered. Notice that today’s app update also includes a few Charity card groups to choose from. All of the Sincerely Ink card groups are filled with design layouts to choose from. Tapping one presents the card in full screen where your own photos and text can be added. Like we mentioned before, all of the regular postcards will be printed and mailed for you at $1.99 US. 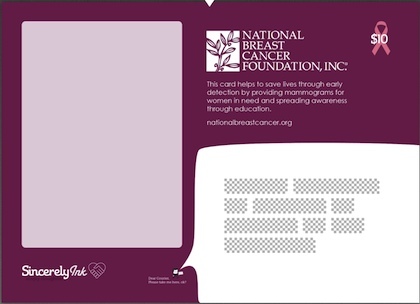 Below is an example of one of the Charity groups of cards where you can choose the layout of the card with a higher price that serves as both the print/mailing of the card as well as the donation. Different card layouts carry a different charge and donation amount. When you choose a card associated with a charity, a pop up window appears as a reminder that the card is more than the default $1.99. Sincerely Ink sends 70% of the money paid for one of the special cards to the charity chosen. On the address side of the card, you can add a lot of text on the whole left half of the card. Cards sent that are linked to a charity donation carry text explaining the charity. Sincerely Ink cards do not require require the address be typed in, using name/addresses from the iPad’s contacts.